A long time ago I promised Reggier Rimbaud to build her a new vardo (or gypsy wagon). Because she's a fun person and because it would be a fun build. I finally got around to building it and I like the way it turned out. It has way too many textures for such a small build (comme d'habitude) and it takes ages to rez them all but it does have a lot of details to look at. 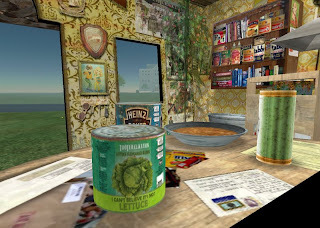 My favorites are the canned lettuce and the picture of a young Pavig Lok. But there's also beans. a picture of Rimbaud (the poet, not Reggier) canned sock, culinary books on roadkill, beans, gastritis, a bean plant, a dental plaque, lots of rats, beans, money, a (new! improved!) filthy bed, beans, a gun, flags, and much more. So somehow a beans theme also slipped into the build, and I have no idea why. Maybe I was hungry? Flatulent? Probably both. I added a whopping 15 poses which are fun to find. But you can also use the spoiler notecard. 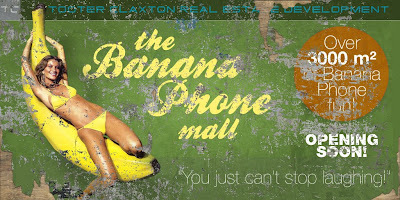 Reggier threw me a party* when the vardo was done: 'Tooter Claxton appreciation day', lol. That was really fun until Orhalla came with the bad news about Patty1 getting injured in Iraq. You probably read about that by now here or here or here. So I'm a slow blogger. Patty1 is back inworld, laughing out loud still hurts, but I saw she had a party last night, so that must be getting better too. Good! 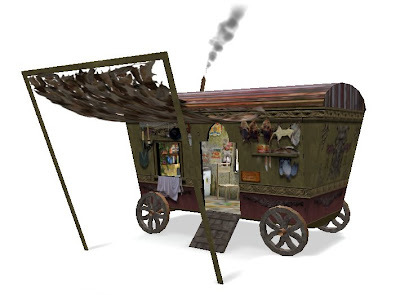 The vardo is available at my shop. It's free to take. * In the invitation Reggier mentioned I got a job at the LDPW, Linden Department of Public Works, which I don't. At least not yet anyway. Blue Linden im-ed me with an invite to apply, that's all. Which I did. But then he invited everyone didn't he? Haha. Thanks to all the silly people that run around in my avatars I could afford to up my tier and buy an extra 4000 m2 in Oculea! Some of it is across the tracks from the shop, behind the station and bank, the biggest piece (3000 m2) is close to the Hobo infohub, near the Calleta border. I have some plans for the extra 1000 across the tracks, (be patient. Very patient.) the strip in the south will remain empty until I finished there. Across the tracks from my shop in Oculea is the infohub of the SLLU group which I am a member of. 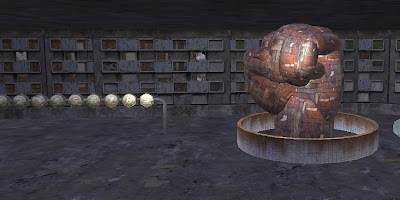 The Second Life Left Unity group 'seeks creative, non violent means to foster revolutionary social dialogue via the virtual world platform of Second Life'. In practice this means organizing, hosting and participating in demonstrations, exhibitions, discussions and other lefty events. Yay! (more here). I made a new building for the hub. A nine story tower block that rises high into the Oculea sky. The building is made to give free space to 'non governmental organisations', left and protest groups et cetera. If you know of such a group -in real or second life- that can use space in the building, contact me or someone else of the SLLU group. At first I wanted to make the entire thing temp rezzed, so I could be primhogging like a... well... mad cow! I made fifteen different cubicles with which I could add new floors in no time. 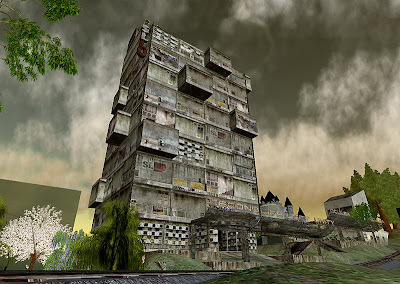 Which I did of course, higher and higher, until the building was over 400 prims big. But when I had it all set up in the temp rezzers and tried rezzing it I found big chunks were vanishing randomly. Aley Arai to the rescue! She patiently explained to me how temp rezzers work. If I remember right -correct me if I am wrong, please- it makes the prims rez like any 'real' prim, but they get taken away and rerezzed very quickly so the prim counter of the land can't keep up with it. This works fine for small low prim structures (like my hobo ruin) but the primmy monster I had built took too long to rerez and that was why I was seeing parts of the building disappear from time to time. As I have said before, Aley also showed me some nifty tricks with megaprims that I used to rebuild the SLLU tower block. Always great to get advice from the best builders in SL, thanks Aley! I have now rebuilt it. It's as high as it was, 9 floors, and only slightly less complex in it's construction than the first version. It's still modular, so I can add more floors quickly when needed. And I managed to stay under 200 prims. Not bad. The ground floor will be used for exhibitions and other temporary activities, the other floors for the groups, and the top floor for meetings and fun.